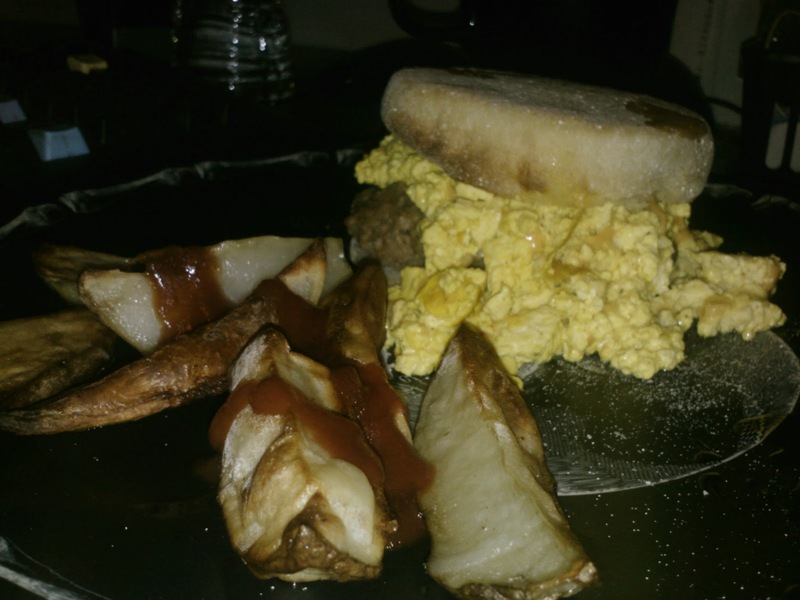 The breakfast sandwich: a fast food fave that is usually some sort of meat and egg combo...Well, I made my own tasty (if I do say so myself) vegan version for dinner a few nights back and we have a winner! The Vegg kindly sent me a packet of their product to try out and I decided to bust it out for this. The Vegg is the first ever vegan egg yolk replacement and new on the scene, After reading what others were doing with it, I wanted to try something simple. The package says to use a blender or a food processor - not to mix by hand. I read that this is to give you a smooth result. However since I was using a 1/2 teasppon and a bit of water my food processor would eat it up and it would just be a hassle. I whipped it by hand in a small bowl with a fork, not smooth but good enough. The smell hit me right away - very eggy, so much so I was kinda freaked out and had Matt smell it, he was like 'whatever'. After browning my crumbled tofu in some olive oil with a pinch of turmeric and other spices I mixed in The Vegg, right away it made my scramble get all gooey like scrambled eggs of past - something tofu just on its own cannot do. The Vegg is an interesting product to say the least! After a few minutes I sprinkled on some cheddar Daiya and pushed it off to the side to brown some vegan sausage patties all while toasting some English muffins. All the makings of an awesome breakfast sandwich right? Well, I followed Emril's advice and kicked it up a notch. Enter VEGAN SWEAT (drum roll!!!)!!!! 2 parts maple agave to one part Toranni's bacon flavored syrup - which is vegan and kosher! Mix the two together and spread it on your English muffins or take a shot of it! It is so breakfast-y good. This idea came to me last week when I was watching some food/travel show taking place in San Francisco. They were at a bar and the cook was talking about vegan sweat a vegan maple-bacon product, I was curious, could not find it online and wanted to create my own! 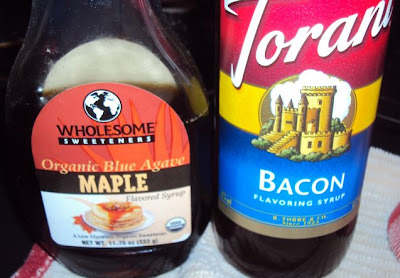 The next day I was in Cost Plus buying some hot sauce and tea, I saw the Toranni bacon syrup, Googled to see if it was vegan and it was, and my version of vegan sweat happened! To assemble the sandwich you just coat each side of the English muffin with a bit (or a lot) of vegan sweat, place on a patty then top with the scramble. I served it with some rustic sliced potatoes I cut up and toasted with a bit of olive oil and sea salt. Eat and enjoy! If you have extra vegan sweat and vegan sausage patties try dipping the patty in the sweat and eating it - yummy!